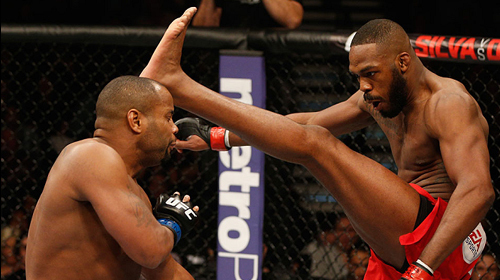 Take a look at some of the biggest impacts of UFC in super slow motion. 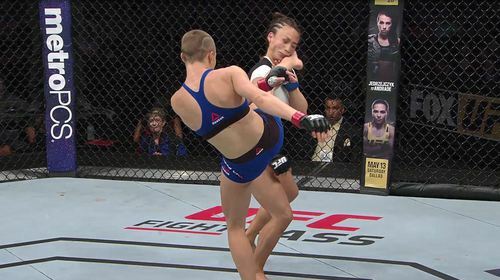 UFC 222: Fight Motion Mar 6, 2018 (1:57) Take a slow motion trip look back at some of the highlights from UFC 222: Cyborg vs Kunitskaya. 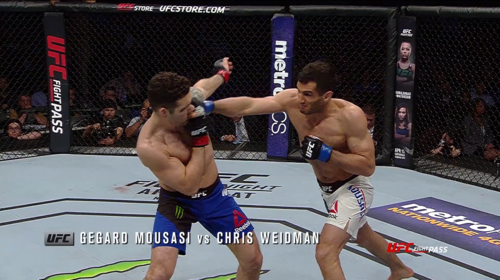 UFC 221: Fight Motion Feb 9, 2018 (1:28) Experience the highlights from UFC 221: Romero vs Rockhold in slow-motion with the latest installment of Fight Motion. UFC 220: Fight Motion Jan 22, 2018 (1:54) Take a slow motion trip through the most exciting moments of UFC 220: Miocic vs Ngannou. 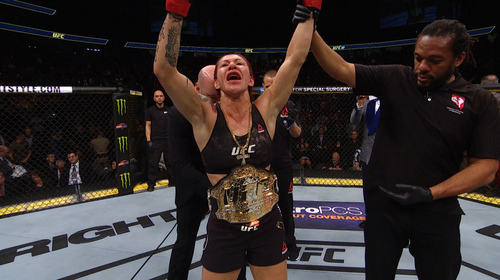 UFC 219: Fight Motion Jan 3, 2018 (1:50) Take a slow motion trip through the final UFC event of year at UFC 219 where Cris Cyborg retained her featherweight belt. Fight Night Winnipeg: Fight Motion Dec 18, 2017 (1:54) Take a slow motion trip through some of the highlights from Fight Night Winnipeg. 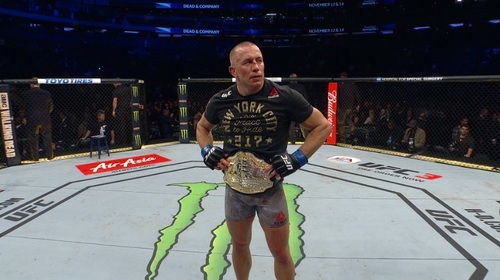 UFC 217: Fight Motion Nov 3, 2017 (2:31) Take a slow-motion trip through the historic UFC 217: Bisping vs St-Pierre event from Madison Square Garden that saw three new champions crowned. 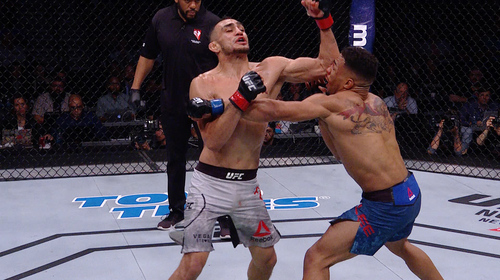 UFC 216: Fight Motion Oct 5, 2017 (2:16) Relive the slow-motion highlights from UFC 216: Ferguson vs Lee where a new interim lightweight champion was crowned and Demetrious Johnson made history with his 11th consecutive title defense. 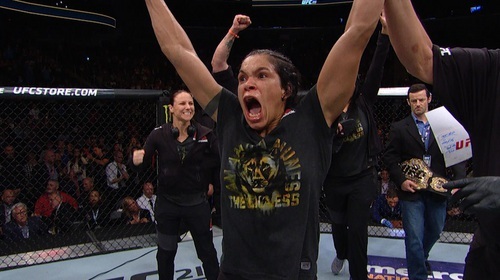 UFC 215: Fight Motion Sep 12, 2017 (2:51) Relive the most thrilling moments of UFC 215 in super-slow motion in our latest installment of Fight Motion featuring Amanda Nunes, Henry Cejudo and more. 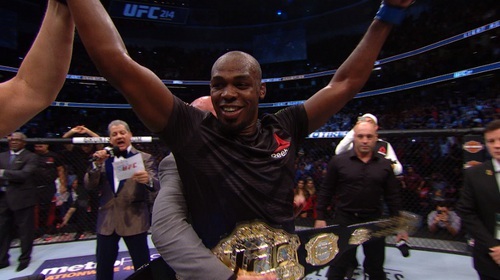 UFC 214: Fight Motion Aug 2, 2017 (2:53) Relive the slow-motion highlights from historic UFC 214 in Anaheim, CA where Jon Jones made his thrilling return to The Octagon to reclaim the belt. 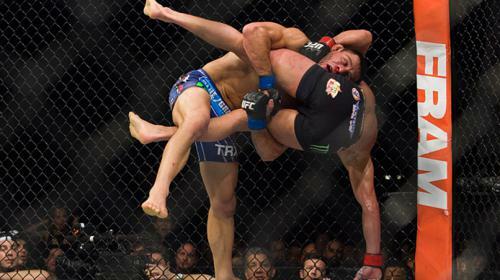 See this and much more in UFC 214: Fight Motion. UFC 213: Fight Motion Jul 12, 2017 (3:28) Re-live some of the best moments from the historic UFC 213 in this edition of Fight Motion. UFC 211: Fight Motion May 16, 2017 (2:16) Re-live some of the best moments from the historic UFC 211 in this edition of Fight Motion. 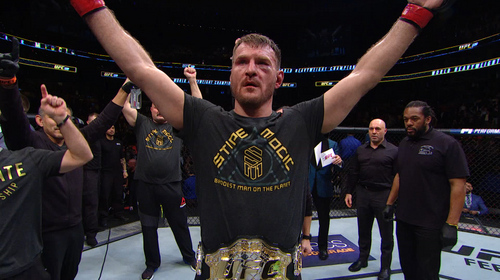 UFC 210: Fight Motion Apr 11, 2017 (2:32) Re-live some of the best moments from the historic UFC 210 in this edition of Fight Motion. UFC 209: Fight Motion Mar 7, 2017 (3:24) Take a slow motion trip through some of the highlights of UFC 209: Woodley vs Thompson 2. 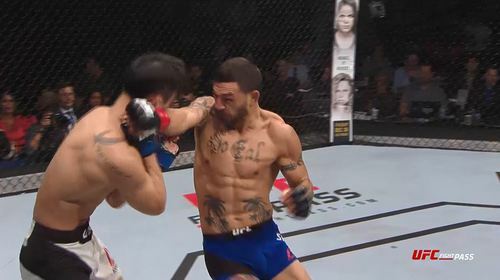 UFC 206: Fight Motion Dec 13, 2016 (2:31) Take a slow motion trip through some of the highlights of UFC 206: Holloway vs Pettis from Saturday, December 10 in Toronto, Canada including the instant classic and fight-of-year contender Cub Swanson vs Dooho Choi. 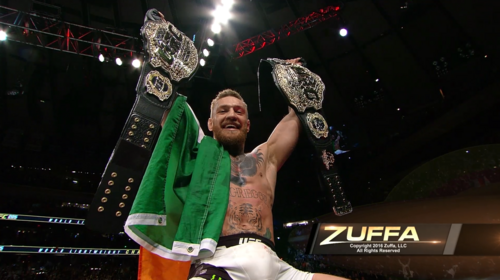 UFC 205: Fight Motion Nov 14, 2016 (1:34) Check out the slow motion footage from some of the most exciting moments from UFC 205: Alvarez vs McGregor. 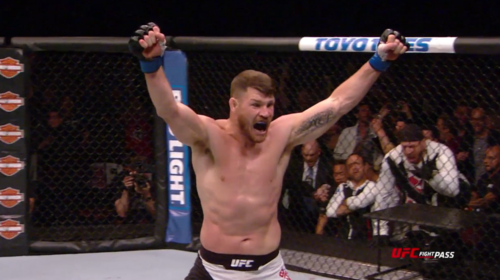 UFC 204: Fight Motion Oct 11, 2016 (2:43) Take a slow motion trip through some of the highlights of UFC 204, featuring the middleweight title fight rematch between Michael Bisping and Dan Henderson. 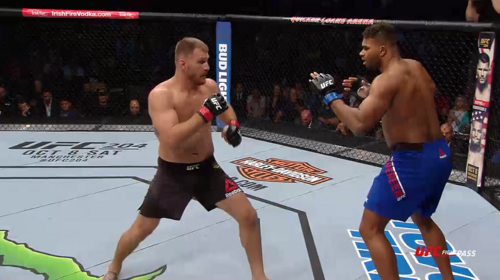 UFC 203: Fight Motion Sep 13, 2016 (2:50) Take a slow motion trip through some of the highlights of the entire UFC 203 event, featuring the heavyweight title fight between Stipe Miocic and Alistair Overeem. 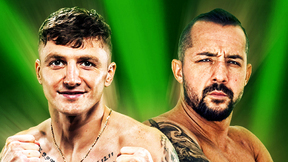 Fight Night Kansas City: Fight Motion Sep 13, 2016 (2:12) Take a slow motion trip through some of the highlights from Fight Night Kansas City: Johnson vs Reis, featuring the flyweight title fight between Demetrious "Mighty Mouse" Johnson and Wilson Reis. 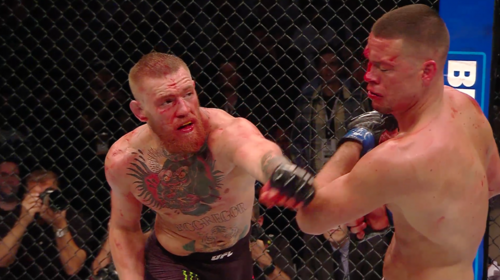 UFC 202: Fight Motion Aug 23, 2016 (3:13) Take a slow motion trip through some of the highlights of the entire UFC 202 event, featuring Conor McGregor and Nate Diaz. 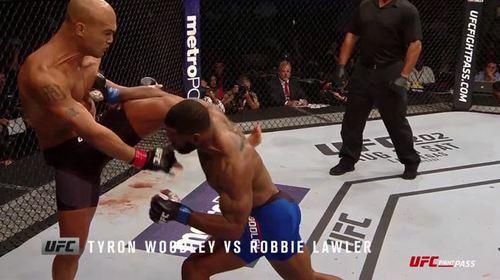 UFC 201: Fight Motion Aug 2, 2016 (2:42) Check out the super slow-mo highlights from UFC 201: Lawler vs Woodley. 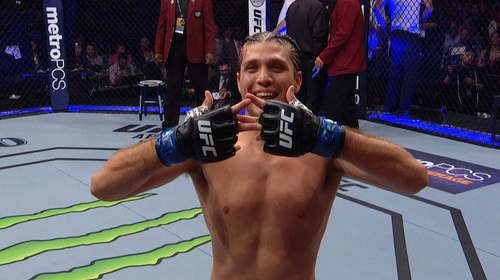 UFC 200: Fight Motion Jul 12, 2016 (3:30) Check out the super slow-mo highlights from the historic UFC 200: Tate vs Nunes event in Las Vegas, NV. 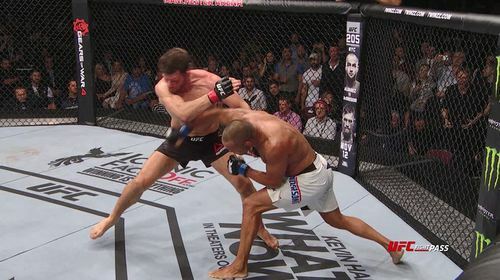 UFC 199: Fight Motion Jun 7, 2016 (2:08) Check out the super slow-mo highlights from UFC 199: Rockhold vs Bisping 2. UFC 197: Fight Motion Apr 26, 2016 (2:43) See the super slow motion breakdown and highlights at UFC 197: Jones vs Saint Preux. 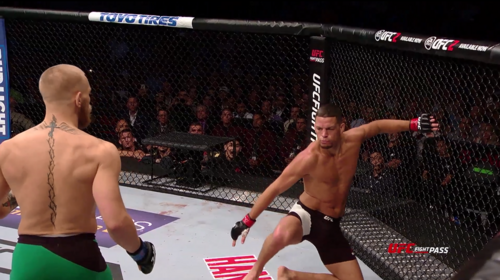 UFC 196: Fight Motion Mar 11, 2016 (1:41) Check out the super slow-mo footage from UFC 196: McGregor vs Diaz. 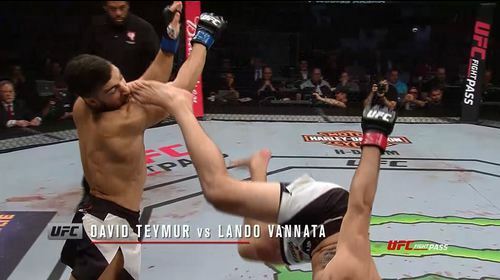 UFC 195: Fight Motion Jan 8, 2016 (2:41) Check out the super slow mo footage from UFC 195: Lawler vs Condit. 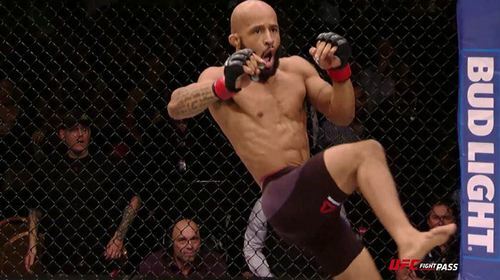 Johnson vs Dodson: Fight Motion Aug 31, 2015 (2:27) See the super slow motion breakdown and highlights from the first bout between Demetrious Johnson and John Dodson. 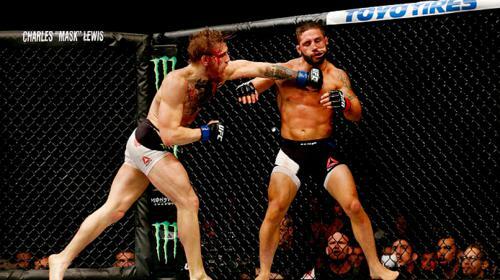 UFC 189: Fight Motion Jul 15, 2015 (2:29) See the super slow motion breakdown and highlights from UFC 189: Mendes vs McGregor. 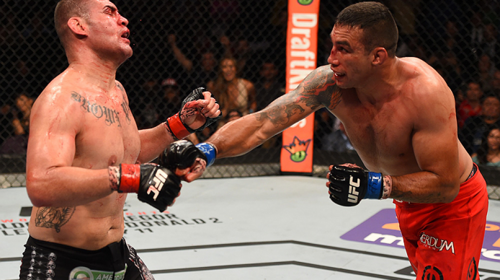 UFC 188: Fight Motion Jun 17, 2015 (1:30) See the super slow motion breakdown and highlights from UFC 188: Velasquez vs. Werdum. 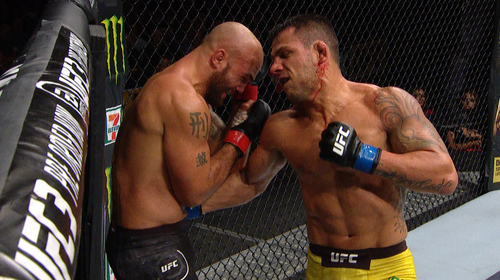 UFC 185: Fight Motion Mar 17, 2015 (1:29) See the super slow motion breakdown and highlights from UFC 185: Pettis vs. dos Anjos.